My soul magnifies the Lord, and my spirit has rejoiced in God my Savior, for He who is mighty has done great things for me, and holy is His name. May God be your silver and gold. He is the source of hope and peace. We do not need anything more besides the One who said: I am the Light of the World. Let the Word of God speak to you as to Israel of old. May the peace of the Lord of Hosts be with you all this Christmas and throughout 2016. 31. It has begun… look up and take hold. The unspoken, universal announcement has been made. The lights are up, the decoration-plans executed. Retail and wholesale are ready for the harvest and their advertising campaigns spell out the demands of the season. Headaches over gifts and travel plans are painful and real and emphasize the heavy, hurting burden of the so-called time of joy and celebration. Tills and credit card machines deafen the music in the shopping centres all over the world. In this world the celebration of Christmas will once again come and go with all the flagrant perversion of the truth and distorted exploitation of the wonder. Just a superficial imagining of the desperation and destruction around us and the worldwide clamour of guns and bombs should smother the festivities. How many people are stunned by the bloodshed and injury of war, violence and abuse this Christmas season? Dear Father, we ask you in the precious, powerful Name of your Son, Jesus, whose coming we celebrate, to let your kingdom come into the chaos around us. Let your Word live in us through your Holy Spirit to enable us to heal and encourage. We crown you as the King of Christmas. Help us to forgive, protect us from evil and provide the fullness that comes only from you, to enable us to fill this season with the Truth that it needs. One God, Immortal, Invisible, ever and always. Oh, yes! This is our prayer, but it is not all. Let us make a realistic survey of the wonder of Christmas, in which we as the chosen ones, the privileged earthlings to be called children of God, are called to give content to the season. Jesus is the core, the cornerstone, the foundation and substance of Christmas. Without Him the feast is the creaking of rusty hinge, the clatter of an empty tin being kicked around by bored boys. The purpose of Christmas is to show us the heart of God. He is the most magnificent Father, He is the Prince of Peace, He is the great Counselor. He is enough reason and the ONLY reason for the Feast. Let us then celebrate in the fullness of the vine that speaks of provision and prosperity at a deep inner level. Jesus is the Saviour of the world. It is the message that we know and proclaim. Rightly so. It is within the empty, dissonance that we, the church of Jesus, determine the qualitative content of the Feast. Don’t be upset when they haul you before the civil authorities. Without knowing it, they’ve done you—and me—a favor, given you a platform for preaching the kingdom news! And don’t worry about what you’ll say or how you’ll say it. The right words will be there; the Spirit of your Father will supply the words. Grab hold of the promise of Holy Spirit words for the occasion. There is no higher authority on earth than the church of Jesus Christ. Did you hear that? Take a Selah-moment and let it settle in your mind. Nobody on this earth has higher spiritual authority than the born-again, blood bought, Word-strengthened child of God! Authority is a well known, accepted part of life. Parents have authority over their children, managers over employees, governments over citizens, kings over subjects. In the spiritual realm there are layers of authority – angels, archangels, cherubs, seraphim’s and others, as also in the kingdom of darkness. The evil spirits acknowledged Jesus’ authority over them. But Jesus rebuked him, saying, “Be quiet, and come out of him!” And when the demon had thrown him in their midst, it came out of him and did not hurt him. For He had commanded the unclean spirit to come out of the man. What about us? What authority do we have? Only what is given to us by Jesus Himself. We are children of God. We have been given the authority and live it from our privileged position through the Cross where we are sitting with Christ in heavenly places. Sitting by the pigs the son prepares a speech to beg his dad to take him back a labourer. In the arms of his father he realizes that he had no right to ask for the position of a slave. He was a son, and nothing could change that. His father cut him short and did not allow the full declaration of guilt and shame to be pronounced over himself. His identity is restored so that there is no record of his humiliation and wrong decisions. Just this past week, I heard the example of the record that is taken when a child learns to ride a bike. The photo’s and video are usually about the triumphant success of the first solo-ride. All the bloody knees and teary falls are not recorded. Are you ready to clothe yourself in you best party gear and give some content to Christmas? We all know that Christmas is also marked by drunkenness and debauchery. In Ephesians 5:18 Paul warns against it. And do not be drunk with wine, in which is dissipation; but be filled with the Spirit. It is the effect of a self-abandonment, by which the sensual or passionate elements of the nature are stimulated to frenzy, while the self-controlling judgment is drugged to sleep. Why would Paul bring the infilling of the Holy Spirit into this context? A drunken person does not have control over any part of his thoughts. All his thoughts and actions are controlled by the drunkenness. We as believers are filled with the Holy Spirit, but keep some thoughts under the control of fear and unbelief. Part of us is in agreement with demonic activity that is always trying to undermine our powerful faith-life. Fear and unbelief weakens us. Let us allow the Holy Spirit to fully control our thinking, rinsing out the fear and doubt just like wine controls drunken thinking. 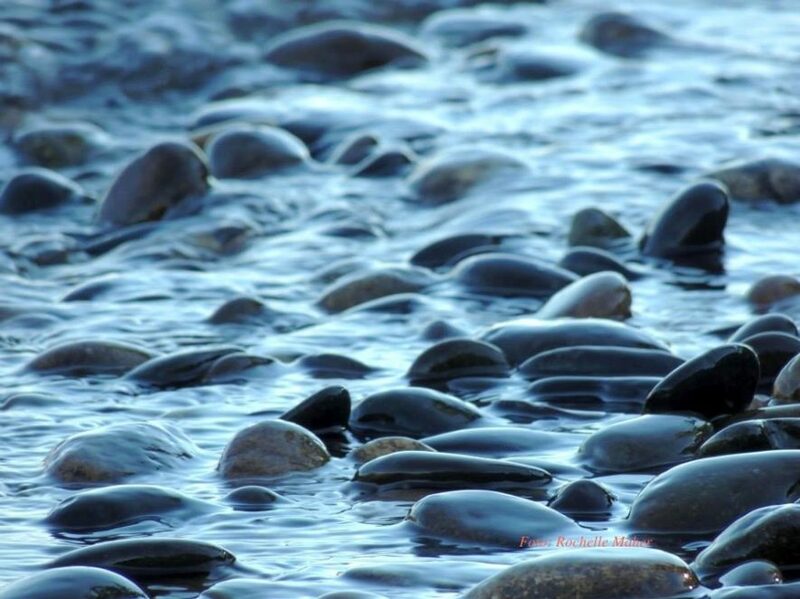 Pebble pals, hold on to your pebbles, your river stones. Remember your anchorless fellow earthlings and make a difference this Season.